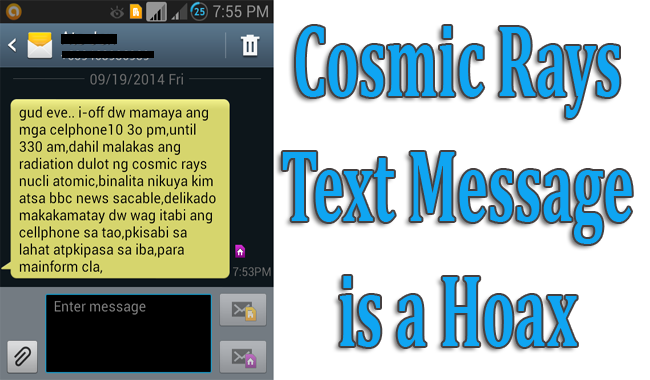 Last night, a text hoax about cosmic rays circulated among Filipinos. According to the text, phones and gadgets must be turned off from 10:30pm to 3:30am due to the radiation that will pass through earth called cosmic rays. It even cited Kim Atienza, popularly known as Kuya Kim, CCN and BBC News as sources. While many versions circulated not only in the Philippines but also in other countries as well, it all talks about turning the phone off due to fatal reasons at certain hours. Meanwhile, Kuya Kim posted on his Twitter account and denies being involved with the said message. He confirmed that it is a hoax and people must not believe in it. The message pretending to care for friends and loved ones aims to make people turn off their phones, cutting off all communications from those who might call or text them. Then the culprits could pretend that they had kidnapped the person and since the family won’t be able to reach their loved one, they would believe the criminal. Also, this prank might just simply be made just to make people panic. It was 2008 when almost the same message was circulated to induce panic to people. No reports confirmed that such cosmic rays would be fatal to us living on earth. Eath’s atmosphere is enough to filter out any harmful effects of cosmic rays from the other heavenly bodies. According to philstar.com, there was no warning issued by any state science agencies with regards of the message. People must validate information first before believing in anything passed through impersonal messages. Just like in internet, not all messages and news posted are true. Be critical to save your time and maybe your life as well.